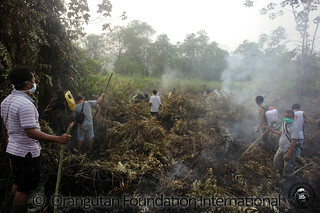 OFI and its supporters made a focused effort to buy forest for the orangutans and other wildlife. If these forests and the forests in the Park burn down, our efforts will have been futile. 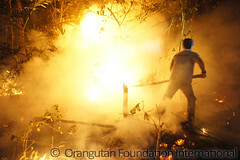 As we watch the forests go up in flames our hearts bleed for the orangutans. Please help us. Please help the orangutans. 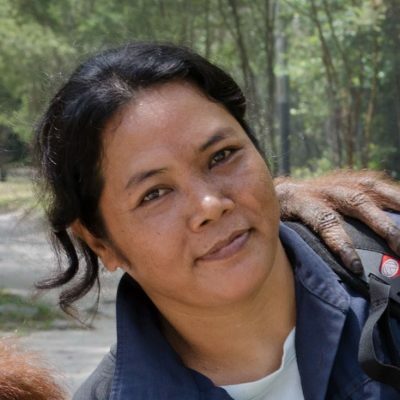 Please help OFI protect not only orangutans but also their habitat. Without the forests orangutans will not survive. Continue reading. How do the fires start? 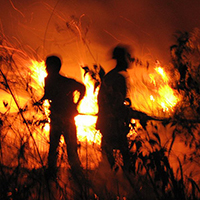 The fires in Borneo are set by humans to clear land and/or to establish a claim over land that may not have legal documentation. Once fires start, they can easily run out of control and spread to adjacent forests. 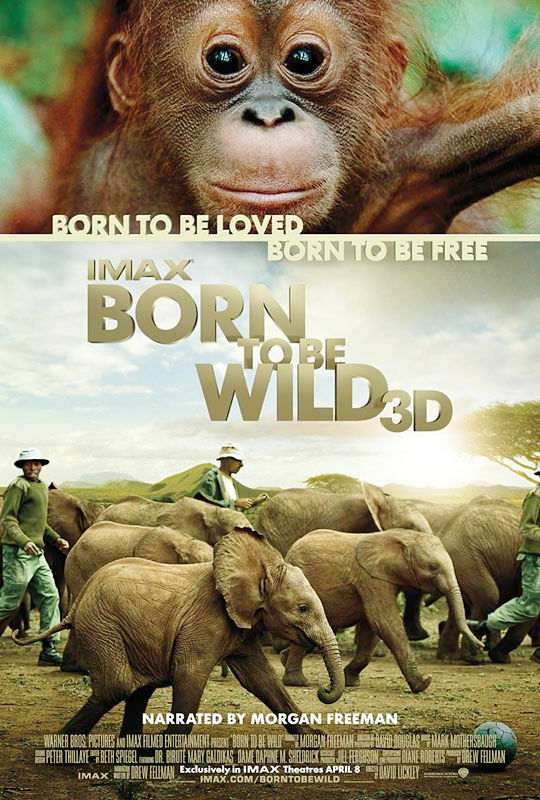 In the middle of the 20th century, Borneo was still an island dominated by ancient, pristine rain forests. Traditional Dayak farming methods had left the forests almost entirely intact for centuries. In the 1980s and 1990s Borneo underwent a drastic transition as industrialized nations became interested in its forest resources. Forests were felled at a rate far surpassing the deforestation rate in any other place in the world at any other point in human history. Virgin (or “primary”) rain forest is not usually vulnerable to forest fires. But where trees have been felled, secondary forest and bush takes its place – vegetation that is much more prone to drying out, and thus burning easily in drought conditions. Today, fires are primarily set by people to clear the land to prepare it for agriculture. “Slash and burn” practices are used both by local communities and by large-scale commercial developers. 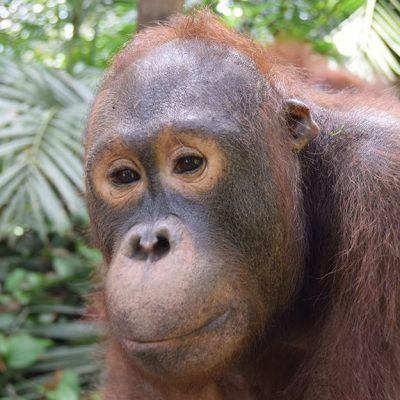 What about the Orangutan Legacy Forest and land that OFI owns? 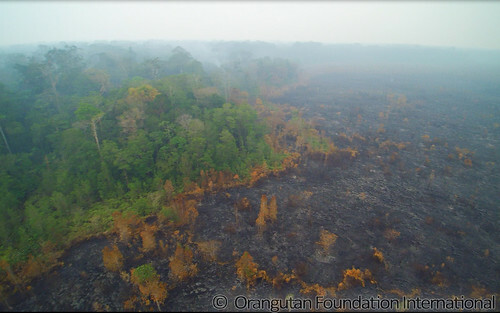 2015 saw over four months of fires within the Orangutan Legacy Forest (particularly in the Rawa Kuno area). OFI staff fought the fires non-stop but it wasn’t enough. 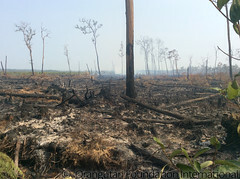 Nearly half of the Orangutan Legacy Forest was damaged by the fires, and almost a third was destroyed completely. Why are the fires so dangerous? They increase pollution and cause health problems: In Borneo’s colossal fires of 1997-1998, smoke covered an area of 2,000 by 4,000 kilometers. Pollution of this magnitude not only left hundreds of thousands of people across Borneo with significant respiratory problems, but also prevented fires from being extinguished through natural means. Soot particles in smoke caused small water droplets in clouds to condense, preventing the buildup of large droplets. It is the large droplets which fall as rain that puts out fires – another link in a vicious cycle of rain forest fire. They damage the livelihoods of local farmers: Just as fire spreads to forest, fire also spreads to agricultural lands, damaging the livelihoods of small-scale farmers.As more forest disappears, the livelihoods of the few remaining traditional groups of indigenous people come under threat as well. They do not naturally occur in the rain forest ecosystem: In some areas of the world, like northern boreal forest in Canada and Russia, fires occur naturally and are now managed by governments because these fires serve an important ecological function. But fires are not meant to occur in the rain forest ecosystem. It takes rain forests millennia to fully recover from being cleared by fire. This means great losses among some of the most unique plant and animal life in the world. Were it not for human activity, fires here would be extremely rare. Unlike the temperate forests of North America, where trees like the lodge pole pine depend on occasional fires for reproduction, the fires in Borneo serve no particular purpose. They are purely destructive. What makes peat swamp fires worse than other forest fires? Burning peat forest is particularly harmful. Peat deposits store huge amounts of carbon below ground. When peat burns, this is released into the atmosphere as carbon dioxide. In the infamous fires of 1997-1998, between 0.8 and 2.5 gigatons of carbon dioxide were released into the atmosphere. Globally, the clearance of peatlands (by fire or logging) contributes about 10 per cent of all greenhouse gas emissions. Due to the thick layer of peat, which is an enormously important carbon storage system for the planet, the fires in Borneo release an extraordinary amount of CO2 into the environment. The emissions from a peat forest fire are much higher than a fire of comparable size in North America, where it’s usually just the trees and vegetation above ground burning. What about the risk to the orangutans? As fires and development destroy more forest, we are increasingly hard-pressed to secure suitable habitat to release these orphans once they are recovered and become old enough to return to the wild. Not to mention the orangutans that, along with many other species, are burned to death in the fires. Others are badly injured with serious burns and smoke-inhalation. Those that survive the fires themselves often starve in the following months with no fruit or leaves to eat. Is there a national Fire Department in Borneo? There is no such thing as a Fire Department in Borneo. There is no government agency devoted to fighting fires. 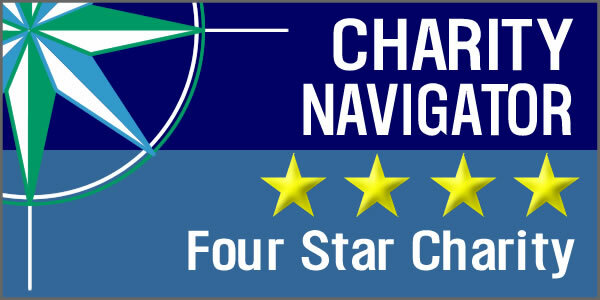 When the fires reach crisis level, various government departments, including the forestry department, the police, and even the military, will step in to help. OFI is a member of the local government commission which manages fire-fighting in the region during such crisis times and works closely with other government agencies in fire-fighting efforts. What is OFI doing to fight the fires? Our office in Pangkalan Bun uses GIS (Geographic Information System) technology to locate hotspots in the area. OFI then provides the local forestry department with updates on these hotspots so they can take action to prevent fires. OFI staff regularly patrol not only the Orangutan Legacy Forest and land that OFI owns, but also Tanjung Puting National Park. At the first sign of fire, we send out a team to put it out. During the height of the fires season, there are times when every single able-bodied OFI staff person has been reassigned from their normal duties to fight fires on the front lines. 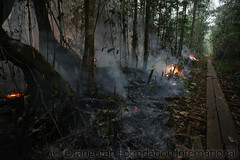 Wildfires in Borneo have become an annual occurrence. It is no longer a question of “if” there will be fires each year. It is now a question of “when” they will come. As locals become accustomed to facing the constant haze and difficult breathing conditions from fire for weeks and months at a time, they talk about the fire season just like any other season. The forests under OFI’s protection will likely be threatened with fire in the future. We want to be fully prepared. We need to upgrade our fire-fighting efforts. This will necessitate buying heavy machinery, more protective gear for our fire-fighters, and replacing all of the equipment that has been destroyed in the flames. Equipment like buckets, hoses, and staff uniforms have to be replaced frequently as they are destroyed in the heat of the fires. We need to dig more moats and wells to store water from the rainy season so it is already on-site in the dry season when the fires start. We need to hire more staff and develop a trained, expert team of fire fighters.